The Prince George's County Fire/EMS Department continues to build on our team. As you are aware, Ben Barksdale will join the Prince George's County Fire/EMS Department as a Lieutenant Colonel this coming Sunday, June 19. Also effective June 19, I had the pleasure of speaking with each of the following individuals today, to congratulate them on their promotions. Each of them were previously filling acting positions where they will continue to work. As additional firefighters complete their academy classes, I anticipate additional promotions very soon and in the coming months. Please join me in congratulating each of these individuals on an important milestone in their careers. 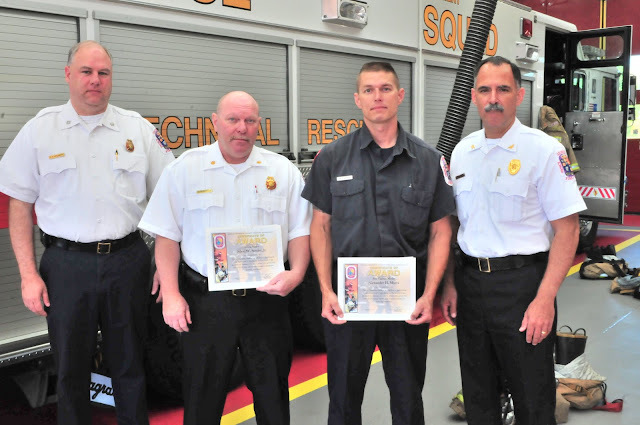 For their exceptional performance on the scene of an incident where a female was rescued from her burning home, Acting Major Adon Snyder and Fire Fighter/Medic Alexander Myers were presented with Prince George’s County Fire/EMS Department Emergency Service Awards. 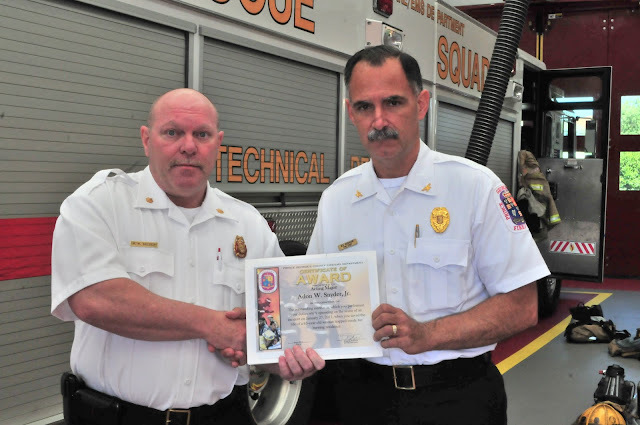 Acting Fire Chief Marc S. Bashoor made the awards presentation at the St. Joseph Fire/EMS Station on Wednesday morning. On the morning of January 27, 2011, Firefighters from the Glenn Dale area were dispatched to the 4500 block of Woodgate Way for a reported house fire with a person trapped. On arrival crews encountered a 1½ story single-family dwelling with thick black smoke and heavy fire showing. Three occupants had escaped after being alerted by a working smoke alarm and were frantically telling the arriving firefighters a family member was still inside the residence. The crew on board the first arriving engine began an aggressive interior attack, attempting to control the spread of the fire. The Rescue Squad from St. Joseph Fire/EMS Station 806 arrived on the scene. Being made aware of the trapped occupant, the crew forcefully searched the area where the victim was believed to be located. Acting Fire Major Adon Snyder had earlier decided to stay over at work, as a snow emergency was in effect. He rode to the incident with Acting Battalion Chief Thomas James. Upon arriving on the scene, Snyder advised that he was going around to the rear of the home and would give an assessment. He was at the rear of the home when he saw the trapped occupant at a second story window and heard her screaming for her life. An exterior crew member, Fire Fighter/Medic Alexander Myers, retrieved a ladder, which was placed to the window by both members in an effort to rescue the victim. The 63-year-old female had severe physical limitations and would not have been able to get out of the window without the assistance of Major Snyder and Fire Fighter Myers. Encountering high heat and thick black smoke Fire Fighter Myers after ascending the ladder to the second floor had to partially enter the window to assist in hoisting the female out of the window and on to the ladder. While doing so he subjected himself to the intense heat and thick smoke of the rooms’ interior. The pair of rescuers brought the seriously burned woman down the ladder and immediately began treating her. The patient was transferred into the care of EMS personnel and transported to the hospital with 2nd degree burns to her lower body and suffering from smoke inhalation. Fire Fighter Myers was also transported and admitted to the Burn Unit at Washington Hospital Center for evaluation of possible thermal injuries he sustained while making the rescue. Acting Major Adon Snyder receives Emergency Service Award from Chief Bashoor. 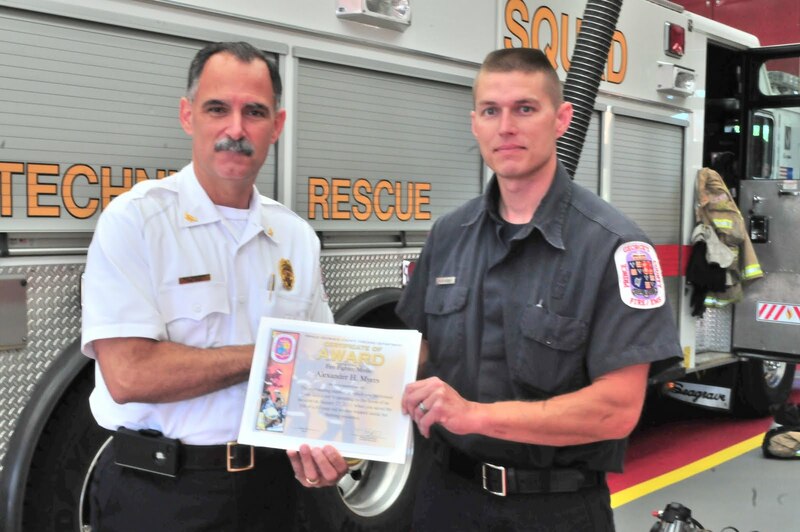 Chief Bashoor presents Emergency Service Award to Fire Fighter/Medic Alexander Myers. Prince George’s County *Fire Investigators have made an arrest in connection with two set fires to occupied homes. The fires occurred yesterday at about 4:15 am in the 1400 block Early Oaks Lane and the 1200 block of Farmingdale Avenue in Capitol Heights. The fire on Early Oaks Lane resulted in $250,000 estimated fire loss and injured 3 civilians and 2 firefighters; all injuries were minor. The Farmingdale Avenue incident involved a set fire to the front porch that caused an estimated $500 in fire loss. A person of interest was identified by witnesses on the scene and taken into custody by County Police. Fire Investigators joined the police in interviews and as a result charged him with four felonies and a misdemeanor. The investigation into these fires and circumstances leading up to the arson's remain open and on going. Additional charges could still be brought against McPherson. *Fire Investigators are members of the Prince George's County Fire/Emergency Medical Services Department assigned to the Office of the Fire Marshal. They are career firefighters that have received additional training in the various aspects of arson detection and the investigation into the cause and origin of fires. Fire Investigators attend the county police academy and graduate as police officers with full law enforcement power and authority including making arrests.